Carleton College, St. Olaf College, and the Northfield Downtown Development Corporation (NDDC) met down by the river. The purpose of the event was to kick off a multi-year, interdisciplinary series of college-community collaboration projects. One of the first scopes of work is computer modeling the Cannon River, so it made sense to meet down in the valley between the two hills. The Cannon River Modeling and subsequent projects are the result of work by the NDDC’s College-Community Collaboration Committee. Formed in 2010 in response to comments made by St. Olaf President David Anderson and Carleton President Steven Poskanzer, the committee initially focused on mutual-marketing leverage and cross-promotional efforts. In 2011, it added alumni recruitment as another strategy. One of the key tactics in this work will be to engage undergraduates in meaningful community projects. Three dozen professors at the two colleges have already contributed their ideas to this initiative. Over sixty potential projects have been identified, organized by four broad categories: Enhancing College-Community Collaboration/Communication, Strengthening Our Sense of Place, Growing the Knowledge-Worker Economy, and Securing Resources/ Building Sustainability. St. Olaf professors Matt Richey and Paul Roback, and their students, are beginning the Cannon River Modeling during the January 2012 Interim. 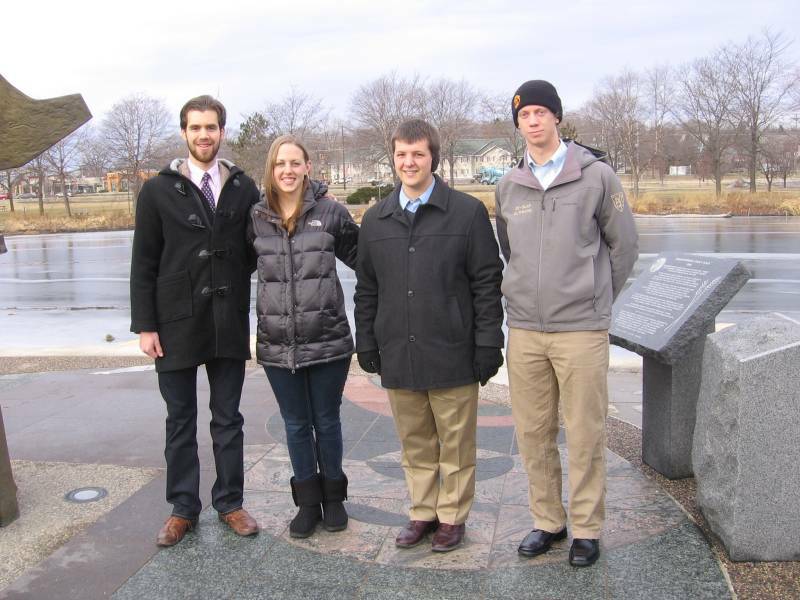 Pictured are St. Olaf Math Majors, Ben Simmons, Lauren Snyder, Matthew Kamrath, and Evan Doucet. Also working on the river modeling project is Laurel Ohm, who was away at a conference. The initial work will focus on researching and reviewing existing river models to study key issues identified by former Carleton student Ana Vang. These models include built environment, bank stability, channel changes, flood potential, sediment toxicity, sediment transport, riparian response, existing wildlife, and invasive species. Carleton College, St. Olaf College, and the NDDC are committed to clear communication, process transparency, and openness to input. An early project team will create a project website to promote sharing of information and assurance of continuity.